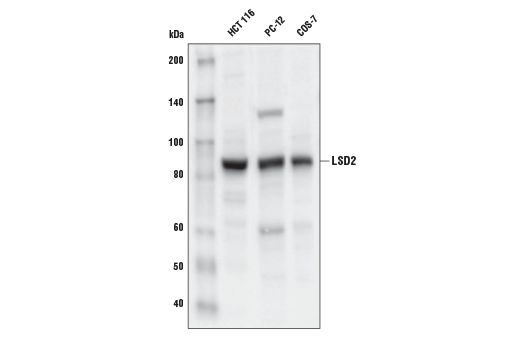 LSD2 (E1R6O) Rabbit mAb recognizes endogenous levels of total LSD2 protein. 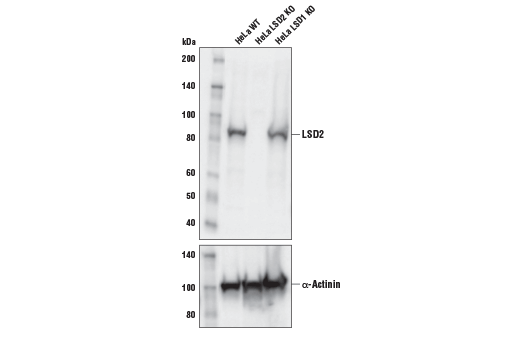 This antibody does not cross-react with LSD1 protein. Monoclonal antibody is produced by immunizing animals with a synthetic peptide corresponding to residues surrounding Leu467 of human LSD2 protein. Western blot analysis of extracts from HCT 116, PC-12, and COS-7 cell lines using LSD2 (E1R6O) Rabbit mAb. Western blot analysis of extracts from wild-type (WT), LSD2 knockout (LSD2 KO), and LSD1 knockout (LSD1 KO) HeLa cells using LSD2 (E1R6O) Rabbit mAb (upper) and α-Actinin (D6F6) XP® Rabbit mAb #6487 (lower). As expected, LSD2 is still expressed in LSD1 knockout HeLa cells. Lysine-specific demethylase 2 (LSD2; also known as AOF1) is a nuclear amine oxidase homolog that acts as a histone demethylase and transcription cofactor protein (1,2). LSD2 functions as a co-repressor protein by demethylating mono-methyl and di-methyl histone H3 Lys4, two marks associated with actively transcribed genes (1,2). LSD2-mediated demethylation of histone H3 Lys4 is required for establishing proper DNA methylation imprints during oogenesis (3). In addition, LSD2 appears to be overexpressed in malignant breast cancers, where it contributes to DNA methylation and repression of multiple tumor suppressor genes (4,5). Furthermore, LSD2 also contains E3 ubiquitin ligase activity that targets O-GlcNac transferase (OGT) for proteosomal degradation (6). A549 lung cancer cell growth is dependent on this E3 ubiquitin ligase activity, suggesting that this function of LSD2 is also important for proper gene regulation (6). Yang, Z. et al. (2010) Cell Res 20, 276-87. Fang, R. et al. (2010) Mol Cell 39, 222-33. Ciccone, D.N. et al. (2009) Nature 461, 415-8. Huang, Y. et al. (2018) Aging (Albany NY) 10, 11-12. Chen, L. et al. (2017) Oncotarget 8, 81737-53. Yang, Y. et al. (2015) Mol Cell 58, 47-59.